From the south of France to the cosmos, from Hollywood to Pasadena to Paris, from silent to sound and color to black & white, from optical printing to hand painting, and from very fast to very slow – tonight’s films address an unusual range of filmmaking techniques, concerns, ideas, even geographical origins. Yet all have one thing in common: they explicitly address the moving image’s origin in the still frame. A film consists of a transparent strip of plastic (the “base”), usually made of a flexible material known as cellulose tri-acetate (popularly called celluloid); and the “emulsion,” a set of chemicals housed in gelatin, which contains the image we see. The emulsion is contained on the base in the shape of a “frame,” a rectangle usually in the proportion of 4 (length) to 3 (width), or 1:33 to 1 (the “aspect ratio”). The frames are arranged sequentially on the base strip. In the case of 16mm film, there are approximately 40 frames to one foot. How is it that we see movement when we are really watching nothing more than a succession of still images? The key is in the way the images are projected, and in the collusion within our bodies of a physiological and a psychological phenomenon. When film moves through a projector, it travels through a center section known as the gate. In the gate, a single frame is held in place long enough for light from a powerful lamp to project the image through the room and onto the screen. While this happens, a shutter rotates between the lamp and the image. This creates an on-off-on-off pattern which means that a single frame is actually projected onto the screen four to five times. Then, with the shutter in the closed position, a new frame moves into view. With standard sound films, this process happens twenty-four times per second, with a “flicker rate” (shutter speed) of perhaps one hundred twenty per second. Because of this regular action of the shutter, for almost exactly half the time we watch a film we are actually completely in the dark. Each of tonight’s films addresses visually or structurally the mysterious conjunction between the still frame and the moving image, and thus in one way or another all the films play with our notions of movement onscreen, and explore the different speeds at which humans can take in information. Another effect possible with frame-by-frame printing is that of superimposition, the layering of one or more images. The raw material of Guy Sherwin’s At the Academy is countdown leader – the kind we see before most films, counting down from 12 to (usually) 3 – along with other ephemera found on leader – phrases such as “A BBC TELEVISION FILM,” “PRINTER START” and “JOIN PICTURE HERE.” Using a contact printer, Sherwin superimposes letters, numbers and geometric forms both in positive and negative. On several levels, At the Academy is a witty tribute to the mechanism of film projection. By extending an ephemeral moment normally used only for the purposes of focusing the lens, it mischievously prolongs the moment of audience anticipation before a film begins. The alternation of positive and negative image produces a dramatic flicker effect which continually reminds us of the nature of film projection. Finally, the virutoso nature of Sherwin’s superimpositions constitute not only a dazzling visual spectacle but also a remarkable graphic work – as delightful to view on the film strip as it is on the screen. One of the most common scientific uses of film has been “stop-motion,” in which frames are taken at a slower rate than the usual twenty-four per second. This allows us to see actions speeded up far beyond their natural rates, and thus to study natural and social processes at a glance, so to speak. 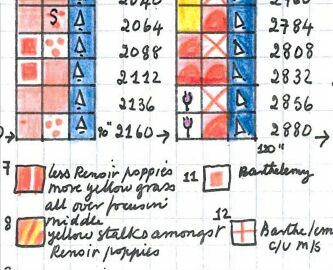 In both Jonas Mekas’s Cassis and Gary Beydler’s Hand Held Day, stop-motion is used to compress an entire day into the space of a few minutes. 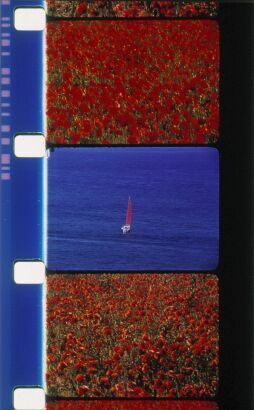 Mekas’s film is a study of activity at a port in Cassis, on the southern coast of France. Sailboats dart across the water like gnats; tourists flit about the base of a lighthouse. As Cassis shows, human activity can seem quite comic when speeded up in this manner. In Hand Held Day, however, stop-motion enhances the natural beauty and drama of a vast landscape. In this film, a set of mountains in southern California is seen only as a small reflection within a hand-held, west-facing mirror which acts as an inner frame. The camera sets up three distinct planes: the close-up of the hand and mirror, the mountains far away in the mirror, and further away, the eastern sky seen behind the hand. Thus we see not only multiple planes of movement, but also are able to face in two opposite directions at once! This perspective allows us to see the eastern sky darken while the western sky becomes imbued with the dramatic colors of the sunset. Another film by Beydler is similarly full of paradox and delight. Pasadena Freeway Stills once again consists of a frame within a frame. We see Beydler step into the outer frame, and watch him place in the inner frame a still photograph of highway traffic, taken from a car. He then takes the photo away and replaces it with a second, almost identical photo, then a third. Gradually, through editing, this process becomes faster and faster, until the only movement in the outer frame is the speedy twitch of Beydler’s hands, and the inner frame becomes “real time.” We discover that the photos in the inner frame are sequential stills from a movie shot from inside a car traveling down the freeway. Gradually, the process slows down and the outer frame returns to normal speed. As David E. James points out, Pasadena Freeway Stills is “divided and doubled within itself spatially and chronologically.” In the inner frame, we travel forward through space in the car, while the larger, outer frame remains relatively flat. At first, the real-time motion of the hands in the outer frame causes us to logically identify with the outer frame as “the present,” while the photos in the inner frame represent the past (as all photos do). Yet this hegemony falls apart as the inner frame gains in speed and begins to represent real time. Similarly, the flatness of the still photos is transmuted to depth via motion, and this depth is contrasted with the flatness of Beydler’s fingertips pressed against the glass. Beginning with a single-frame zoom into a photograph on a wall (perhaps a reference to Michael Snow’s film Wavelength), Pip Chodorov’s Numero 4 gives us a breakneck tour of a seemingly typical day on the streets, sidewalks and parks of Paris. Going Pasadena Freeway Stills one step further in this regard, Chodorov presents photos within film, frames within frames, and representations of spaces within the spaces themselves. Abetted by the pulsing, interlocking rhythms of the music soundtrack, Numero 4 makes full use of the energy and dynamism inherent to single-frame filming. Using this time-honored experimental filmmaking technique, Chodorov, who founded and runs a company dedicated to making historical experimental film more widely available, specifically references such masters of the single frame as Jonas Mekas, Marie Menken, and Rose Lowder. 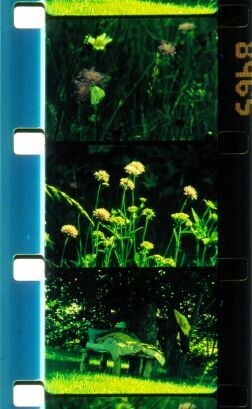 In the Canyon Cinema catalog, Lowder describes how she films the bouquets: “using the filmstrip as a canvas with the freedom to film frames on any part of the strip in any order, running the film through the camera as many times as needed.” Thus, she may film a field of flowers using only every third frame (frames 1, 4, 7 and so on); rewind the film and starting on the second frame, film a farmhouse every third frame; then rewind to the third frame and film a differently colored field of flowers. As the film is projected (at silent speed or eighteen frames per second) the three images merge – not quite superimposed, but not quite separate. (This technique is the basis for another of Lowder’s films seen tonight, the delightful Sailboats and Poppies, in which “the boats sail out of the Vieux port in Marseilles to be amongst the poppy fields.”) In addition, Lowder will sometimes use a stationary camera on a relatively still image such as a single flower, and refocus between each frame, creating a unique type of shimmering onscreen movement – not quite stop-motion – which makes the flower seem to come alive before our eyes. Often, the type of movement seen in the Bouquets seems akin to that of rushing water, appropriate for the films’ concerns with ecology and natural space. And in Bouquet #28, Lowder makes this connection explicit by alternating images of a stream in closeup with a group of daisies. Combining these filming techniques, and using the vast palette of colors available in these locations, Lowder makes exquisite film bouquets which – true to her ecology – seem to fit all of the south of France, or maybe the natural world, into a small, personal space, one frame at a time. On the opposite scale, Stan Brakhage’s Stellar expands both the frame and the screen into the cosmos (though its two-minute running time echoes Lowder’s ecology of the miniature). One of the many hand-painted films which Brakhage produced late in his career, Stellar invokes stars, the evening sky, and the spectacular color imagery one associates with astronomical photos. Brakhage painted each frame by hand, and then printed them at varying rates – as often in the hand-painted films, many of the images go by at am almost overwhelming speed, creating an effect somewhere between sensuous and frightening. In addition to controlling the length of each frame image during the printing process, Brakhage sometimes holds a single frame onscreen long enough to fade it out while the more rapid movement of a group of different frames plays out in superimposition. THANKS TO Anne Dennington and Atlanta Celebrates Photography; Rose Lowder; Robbie Land; and Eyedrum. STILL/MOVING is a Film Love event, programmed and hosted by Andy Ditzler for Frequent Small Meals. Film Love exists to provide access to great but rarely-screened films, and to promote awareness of the rich history of experimental and avant-garde film. Film Love was voted Best Film Series in Atlanta by the critics of Creative Loafing in 2006.